The next lecture will be Monday, June 23, 7 p.m. at the Millburn Library. Please note that the meeting is on MONDAY, instead of our usual Tuesday meeting, due to a scheduling conflict. 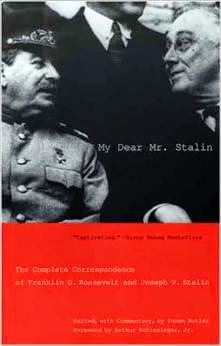 Be sure not to miss this lecture by Susan Butler, who will discuss her award winning book, My Dear Mr. Stalin - the first and only complete collection of correspondence between President Franklin Roosevelt and Joseph Stalin. The book will be available for purchase and signing. This lecture will be the last of this season and the Book Club will reconvene on Tuesday, September 15, when Barbara Boyer will discuss Unit 731, the book about the infamous medical unit of the Japanese. During World War II, Unit 731 performed countless medical experiments on prisoners of war and as well as many civilians. Please remember to come early, as the Glen Avenue bridge is still under repair and traffic in the area can be very heavy, particularly during the early evening hours. In order for the Book Club to be able to attract top notch speakers, it must be able to cover the basic expenses of travel, hotel and meals, incurred by our speakers. In the past, a number of members have made generous contributions to do just that. Please reach out to Dr. John McLaughlin if you are able to make an additional contribution to the Book Club so that we can continue to attract the top notch speakers we have enjoyed in the past. The next lecture will be Tuesday May 20, 2014, as usual, 7 p.m., Millburn Library. Be sure not to miss this lecture by Richard Breitman who will discuss his award winning book, FDR and the Jews. The book will be available for purchase and signing for $20. We expect an overflow crowd so please come early, and remember that the Glen Avenue Bridge is still not repaired. Consequently, traffic in the area is very heavy during the early evening hours. In the past, a number of members have made generous contributions to help defray the expenses of travel, hotel, meals and other expenses of our speakers. For this we are grateful. We are not able to attract top notch speakers without the ability to cover expenses. We would be grateful if any our members would make an additional contribution for this purpose.